We’d love your help. Let us know what’s wrong with this preview of Data Science at the Command Line by Jeroen Janssens. To get you started--whether you're on Windows, OS X, or Linux--author Jeroen Janssens introduces the Data Scien This hands-on guide demonstrates how the flexibility of the command line can help you become a more efficient and productive data scientist. You'll learn how to combine small, yet powerful, command-line tools to quickly obtain, scrub, explore, and model your data. To get you started--whether you're on Windows, OS X, or Linux--author Jeroen Janssens introduces the Data Science Toolbox, an easy-to-install virtual environment packed with over 80 command-line tools. Discover why the command line is an agile, scalable, and extensible technology. Even if you're already comfortable processing data with, say, Python or R, you'll greatly improve your data science workflow by also leveraging the power of the command line. 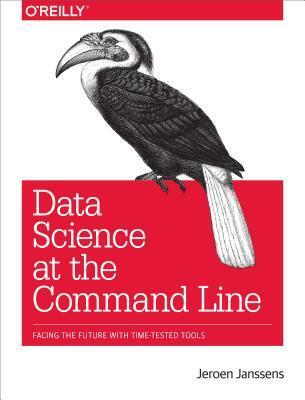 To ask other readers questions about Data Science at the Command Line, please sign up. The book provides an easy and simple route to basic data analysis tasks -- scrubbing and exploration. It will be useful to readers who 1) are interested in data analysis and just getting started, 2) have been using tools such as R and Python for data analysis and have wanted simpler ways to scrub and explore data, or 3) are interested in improving your command-line chops in the context of data analysis. However, this is not the book to learn data analysis/science. The author provides a virtualiza The book provides an easy and simple route to basic data analysis tasks -- scrubbing and exploration. 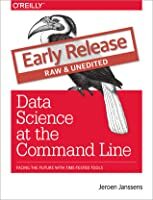 It will be useful to readers who 1) are interested in data analysis and just getting started, 2) have been using tools such as R and Python for data analysis and have wanted simpler ways to scrub and explore data, or 3) are interested in improving your command-line chops in the context of data analysis. However, this is not the book to learn data analysis/science. The author provides a virtualization-based image to try out the tools described in the book. This is great; specifically, for Windows users. However, this did make me wonder if and how (better) would the solutions to translate over to Windows Powershell, which has some nice features absent from Unix shells. Also, while the book mentions numerous tools, many of them are scripts (e.g., scrape, cols) created by the Jeroen Janssens and I wish they were available as installable packages via systems such as apt and port. While the book tries to cover data modeling, it leans quite a bit on R and Python for this purpose. Instead, I would have preferred it would have explored more data scrubbing and exploration tricks using tools such as awk. At <200 pages, the book is a short read but it also can seem a bit light if you are command-line or python/R savvy. That said, as a command-line user, I did learn about some new Unix shell tools/tricks, e.g., crush-tools, seq, parallel, csvsql of csvkit, drake (make for data analysis). I use and love CLI on daily basis, but fact is that it is not suitable for most data analysis tasks. csvkit is nowadays replaced by xsv, drake has not seen a commit since 2015 (and seems not very useful anyway). - some o I use and love CLI on daily basis, but fact is that it is not suitable for most data analysis tasks. So CLI is great, but this book is not. I used this book as more of a guide to get familiar with the regular command line workflow. I find IDEs a much better tool for data science than a command line, as it's replroducible. But nice to know some shortcuts available in bash scripts. This books is a little focused on the tools. Which is good, which also means i need to revisit the book as I explore the tool. The commandline tools introduce is very interesting. I will definitely adopt it. It just didn't bring in a lot of new idea for me. This book will really help you turn your command line hacking into scalable and well managed data projects. This book isn't about BIG data, it's about getting hands on data on your desktop in a flexible, fast and fun way. However, the Author isn't asking you to give up hadoop etc, he's asking you if you'd like another set of tools for another day. The book is well structured, it's flow and style are good and it provides an easy read. If you have no command line experience there's a brief intro but This book will really help you turn your command line hacking into scalable and well managed data projects. If you have no command line experience there's a brief intro but if you're a command line veteran the book probably starts to get interesting around page 50 and this gives you a core of around 100 pages. This is a bit short but it's also densely packed. Basically: If you want to do data science from end-to-end (get data, clean data, explore data, visualize, model and interpret data) and do all this from the command line this book is a very good place to start. Hands on, dozens of tools and examples, Vagrant box provided with everything pre-installed. The book is a little light at times, more info could be given on tools such as drake. Some of the diagrams span across pages and on others the differences between types is lost since the colours aren't significantly different in black and white print. I find this quite disappointing. I enjoyed the book and have some real gains from reading it. In a world which has so many BIG solutions for BIG data it's nice to get a book that provides small,flexible,solid tools that let you have fun with your data at the command line. I'd recommend buying it if you want some hands on fun with data at your desktop. This is an excellent book. Thorough and clear, it has enough basic information for beginners but even intermediate and advanced users will pick up plenty of new tricks. When I've had to solve these types of problems in the past, I've leaned pretty heavily on AWK and, to a lesser extent, XSL (!). This book introduced me to a bunch of utilities that were new to me and reminded me of a few old friends I haven't used in years. Great compilation of well-known, not-so-well-known, and brand-new custom command line tools for OSEMNing with your data. Reads like a good tutorial. Could use a little bit of refinement - e.g. some commands are used multiple times before they are explained in detail. I installed the tools natively, but you can also install a VM instead. But in either case, clone the book's companion repository- it has all the data and the author-supplied command line tools. It is a promising book, mostly for beginners, but an intermediate data scientist will find some good material to learn or will be inspired to dig into some very advanced topics. In general having your own data science toolkit as a service as an idea is great! The book is still in making so it only my preliminary rating. A good but short demonstration of using command line tools to do data science. I have learned quite some new ideas from the book. Well worth reading. It is short, but very useful book. Most of the commands are practical and can be used without a lot of adjustments. Highly recommended reading!